The new Moshe Saba Masri Synagogue in the Sarah Wetsman Davidson Hospital Tower was dedicated on Thursday, April 25, 2013. 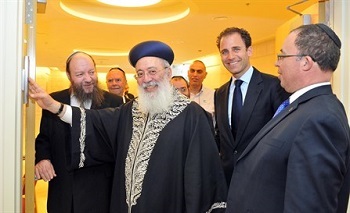 Rishon Le’Zion Rabbi Shlomo Amar, Israel’s chief Sephardic Rabbi, was the guest of honor. Following the unveiling of the dedication plaque, letters from Israeli Prime Minister Benjamin Netanyahu and Mrs. Marcie Natan, Hadassah National President, were read, commemorating the event. A Mincha Prayer was led by Hadassah Rabbi Moshe Klein. Chief Rabbi Shlomo Amar gave a Dvar Torah (words of Torah) and spoke about Moises Saba Masry, in memory of whom the new synagogue was dedicated, and about the generosity of the Saba family.